Today I’m going to show you how to use the Gemini FoilPress from Crafter’s Companion. This product was my top pick from Creativation 2019, a trade show for the craft and hobby industry that is held every year in January. Hi everyone! Thanks for joining me. I’m glad you’re here. The Gemini FoilPress allows you to achieve a foiled impression on any card stock in just a few simple steps. It leaves your project with a beautiful foiled impression. It can be used on so many materials, ribbon, fabric, faux leather, paper, cork, wood, acetate and more! Be sure to check out today’s video to learn more about this great new tool. I’ll walk you through the basics, give you more information and tell you why I love it! If you want to watch today’s video in HD on my YouTube channel, click HERE. Don’t forget to like, subscribe and turn on the notifications while you’re there so you don’t miss any of my paper crafting video tutorials. Here are a few of the things that makes this machine really stand out. It has 9 heat sources spread across the platform, allowing even heat across the entire surface. It offers a built in timer and an audible beep to tell you when it’s ready. It will also shut off automatically if it hasn’t been used in a while. It has three heat settings, allowing you to achieve foiled impressions on more than just card stock and paper! It is compatible with the Gemini Junior and Gemini die cut machines (adapter required for the full size Gemini). It is not compatible with other machines. 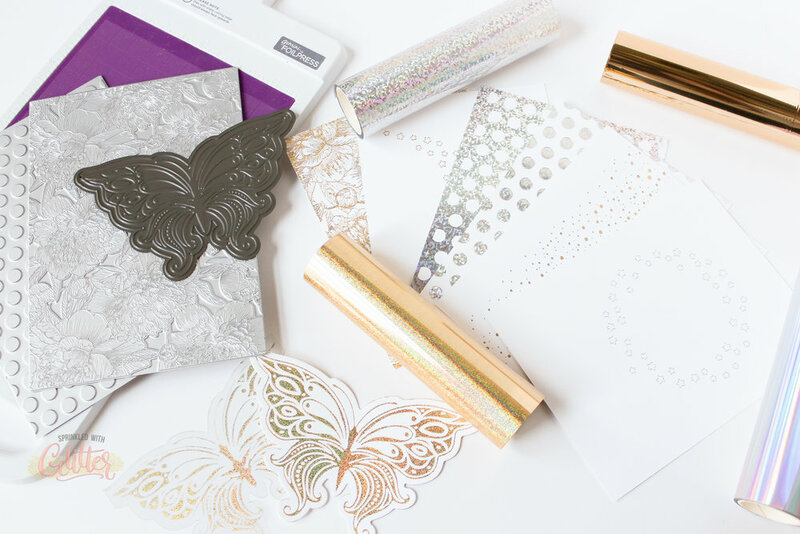 It comes with everything you need to start foiling with you Gemini Junior and Gemini FoilPress. In addition to Foil Stamp and Foil Stamp N Cuts, it is also compatible with your wafer thin dies! I’m loving this machine. And I think you will too! Thanks for stopping by today. I hope you’ve enjoyed this look at the Gemini FoilPress and I hope you’ll give it a try! Until next time, I hope you have a fabulous day! Ink Blending With Life Changing Brushes - And A Big My Favorite Things Sale!